It wasn’t that long ago when we would call a travel agent up when we wanted to book air travel and visit a music store when we wanted to hear the latest release from our favourite band. In less than 30 years, digital technology has completely refashioned how we consume travel services and music products, along with a host of other consumer goods and services. Increasingly, we search online and book our own travel, from the airline “tickets” to the small B&Bs in the places we visit. And more and more of us are subscribing to music services, effectively renting access to our favourite music rather than buying and owning copies of it. How a vast array of consumer products and services are conceived, marketed and sold to us as consumers has undergone a radical transformation in the digital age. Plummeting technology and communication costs has placed powerful mobile devices in our hands that have completely changed how we get information, stay connected with others and entertain ourselves. This digital revolution has largely impacted the back-offices of the financial services industry, but it has notably sidestepped the distribution systems. Virtually every major financial product or service is supported by digital back-end systems. Yet, the marketing and sales of many products, such as investments and insurance, continues to be carried out through a legacy distribution system consisting of advisors, agents and salespeople. However, all of this is about to change dramatically. The revolutionary transformation that digital technology has triggered in consumer businesses is about to be felt in financial services businesses. In this article and presentation, I will try to explain WHY digital technology undermines the prevailing business strategy of the past 30-40 years and HOW financial services firms as well as individual advisors and agents can adapt their businesses to the realities of the new digital age of financial services. This article is also available as a Slideshare presentation if you prefer a more visual experience. The IBM System 360 mainframe computer appeared in 1964 and became the digital foundation of many of the early, automated systems for managing large amounts of data in government and industry. 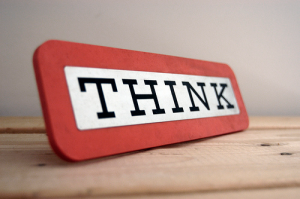 My dad’s first job after university was with IBM and I can clearly recall the iconic IBM “THINK” sign in our house as I was growing up. In junior high school, I elected the computer programming course option. This consisted of penciling in bubbles on cardboard cards that, at the end of each class, got boxed up and sent downtown to the board of education’s VAX computer for processing. The following week, we would get the printout of our BASIC program and begin the debugging process. After that experience, I decided that computer programming wasn’t for me. 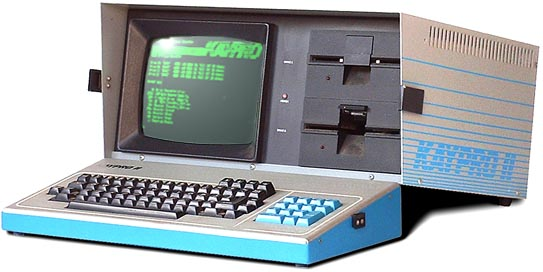 With the appearance of affordable personal computers in the 1980s, typewriters began to be replaced by much more flexible word processors (remember WordStar?) for writing and composing communications. But for me, it was the combination of the PC with the early Internet in the late 1980s that opened up the world. Working for a global ecological non-profit group at the time, we were using portable PCs (Kaypros) combined with Internet access (mostly via landline modem, but sometimes by satellite) to coordinate advocacy campaigns internationally. State-of-the-science information and research in, say, Germany could be quickly transmitted around the world and be used to support environmental policy changes in Canada and the US. In many situations, this kept us a few steps ahead of our corporate and government adversaries. By the 1990s, I had found my entrepreneurial self and was training people on how to use the emerging Internet strategically to get access to information and advance their businesses. This morphed into a website development business as the more visual World Wide Web came together later in the decade. 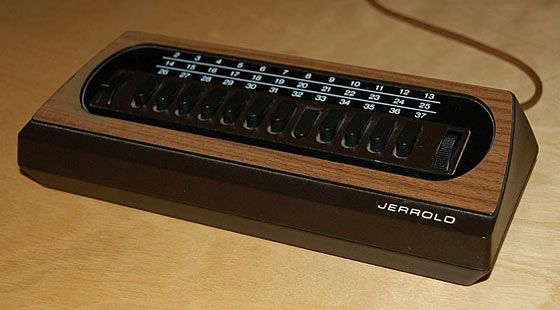 cable television to subscription-based streaming entertainment. For me, the idea of adapting to the technology of the time is a concept that goes back to the 1980s. I earn my living today consulting on strategies and activities that not only did not exist 30 years ago, but could barely be imagined. As we have seen, digital technology has triggered some fundamental changes to business models in a variety of consumer businesses in the past 30 years. Yet, there are a number of other businesses, an example of which is financial services, that haven’t really been fundamentally impacted yet – at least, the foundational business model of distribution hasn’t been impacted yet. Philip Evans of Boston Consulting Group has argued (in this TED talk) that the digital age of connected systems and vast amounts of data has changed the world in such a way as to undermine the fundamental tenets of business strategy in place since the 1970s. His argument goes like this. Economies of scale strategies basically work like this: if you combine two or more businesses into a larger business, you can reduce the costs of production and increase profitability. Vertical value chains are the result of businesses aligning themselves vertically to manufacture and distribute products and services to a market. When these separate businesses amalgamate into one vertically integrated company, it is more cost-effective, and therefore more profitable, to bring products and services to market. This is because each link in a vertical value chain has transaction costs, which are largely costs associated with information processing and communication, and those costs can be reduced and made more efficient inside a larger vertically-integrated entity. The thing is, in the past 20 years, these information processing and communication costs have been plummeting. 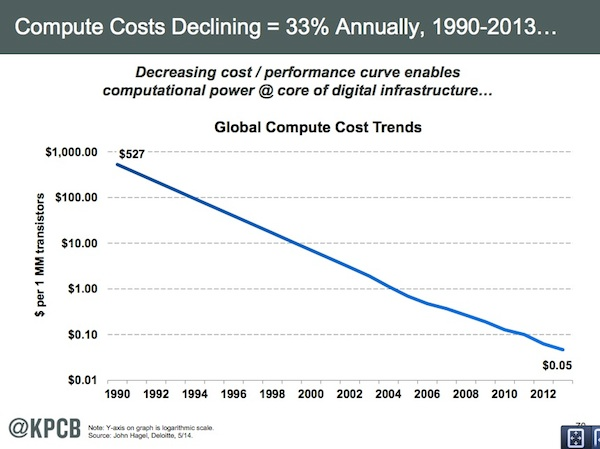 This chart from Mary Meeker’s KPCB Internet Trends presentation clearly illustrate how inexpensive it has become to compute (as well as store and transmit data) compared to 20 or 30 years ago. Evans’ argument is that as these transaction costs have fallen, vertical value chains have uncoupled and begun to re-form horizontally. 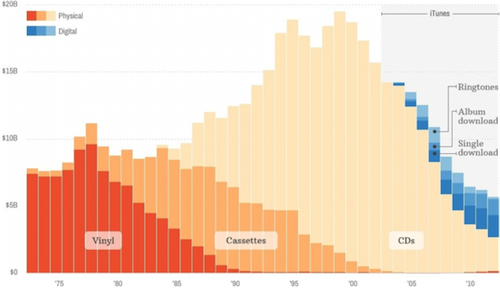 If we look back at music sales from the 1970s to present (see chart below), we can observe that despite the precipitous drop in vinyl record sales, overall growth in music sales was maintained and even grown by cassette and CD sales into the early 2000s. But music sales have been in decline since then. What is notable about this chart is the appearance of Apple (“iTunes” in the chart), a digital technology company known for personal computers and mobile devices such as the iPod music player. Apple’s appearance as a dominant player in the music industry as it digitizing is an example of this disruption of traditional, vertical value chains in the music business. Apple leveraged its existing customer-base and distribution platform to become a key player in the digital music business. This scenario can be generalized in reference to the digitization of financial services. Businesses with existing digital business models, widespread distribution systems, and/or a high degree of brand and consumer loyalty are the ones that increasingly see financial services markets as desirable to enter. Media conglomerates (eg., GE, Disney and Viacom in the US and Rogers and CTVglobemedia in Canada) that have already undergone significant horizontal integration in the past two decades. Of course, these “new market entrants” may also include to the hundreds of financial technology (referred to on Twitter as #fintech) companies sprouting up all over the world, fuelled by a venture capital frenzy. Existing financial services businesses, such as banks, insurance and investment companies, are also eying new areas of financial services where they can branch out horizontally into areas of financial services that offer synergies with existing lines of business. If you’re following the argument so far, you will recognize that this is not merely some sort of cyclical restructuring of the financial services industry. Rather, the digital technology forces at play are in the midst of a fundamental rethinking of the financial services industry and its foundational business models. Technologies like the blockchain, which has revealed itself as the building block of digital currencies such as Bitcoin, is poised to fundamentally disrupt the monetary system. In virtually every other digital disruption in the past 30 years, so-called “middlemen” in the value chain have been cut out. Distributors of recorded music products have gone out of business or had to expand and offer a broader range of products. Travel agents that brokered airline tickets have gone out of business and been replaced with specialized travel service companies that add unique value to the digitally-empowered consumer of travel services. Most financial advisors and insurance agents have their compensation largely tied to the sale or ongoing maintenance of financial products, such as investments or insurance. It is this distribution model for financial products that is the target of an explosion of many fintech plays. This is a sensitive point in an industry like insurance, where the manufacturers of products depend on the current advisor force to sell their products, yet these same manufacturers are also wary of the new market entrants that are threatening to market directly to consumers, going around the traditional advisor/agent distribution systems. In other words, the drive to direct-to-market solutions is a trend that is bigger than the insurance company whose products advisors and agents sell and threatens the insurance manufacturers’ very existence as much as its distributors’. The direct-to-market strategies of insurance or investment companies are motivated by their survival first and foremost, not about cutting out advisors. But that raises the question for advisors: How can you position yourself strategically in the face of such fundamental re-engineering of the business model of financial services and financial product distribution? Growing your business simply isn’t going to give you the benefit it might have in the past, because new market entrants and entrepreneurial start-ups are leveraging digital technology to undercut not just your business, but your business model. These new market entrants are not encumbered by old-school thinking, nor by legacy computer systems, old-fashioned business processes or poor digital skills. There are some very smart marketers out there that want to help you differentiate your brand and leverage digital technology more effectively – and you’re smart to pay attention to them. But marketing alone isn’t going to rescue your business from the coming digital disruption. If you’re not innovating and fundamentally rethinking your business model and the core value proposition your service offering to clients, your digital marketing strategy is merely moving your chairs on the Titanic. Advisors and advisory businesses that want to position themselves strongly and profitably for the digital age need to focus on their most valuable asset – client relationships. Your existing clients have already chosen to do business with you and you’ve earned their trust. If you’re really good, your clients have a deep connection to you and your firm and are highly engaged in the relationship too. The lifetime value of a client relationship is sometimes used to convey the enormous business benefits that come from servicing and retaining clients over long periods of time – even a lifetime. Client retention is a growth driver for many businesses and deep client engagement can drive referrals and greater sales. In the digital age, we also need to look at lifetime value from the client’s perspective and position services so that they provide the client with lifetime value as well. We need to focus on our clients’ life goals and help them make life decisions in the service of those goals. Applying this concept of lifetime value to the advisor-client relationship, there are a number of essential areas that financial services businesses need to focus on in order to survive and thrive in the digital era. 1. 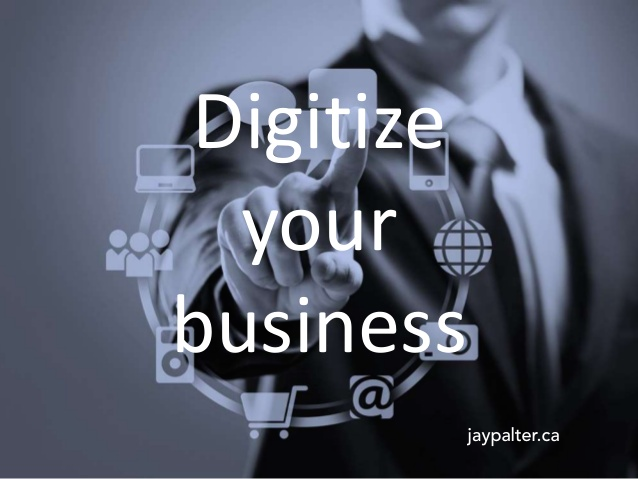 DIGITIZE your client relationships – your most valuable business asset. Do you have a digital CRM system? CRM systems are needed to keep track of client details and ensure that there is an accessible record of interactions between the client and the practice. If a team is servicing the client, team members need to have all relevant details and history at their fingertips. Also, a CRM can help you manage compliance obligations while giving you a more complete picture of your client’s financial and life situation. While CRMs have been around since the 1980s, far too many financial advisory practices do not have reliable and secure digital systems for managing customer data. 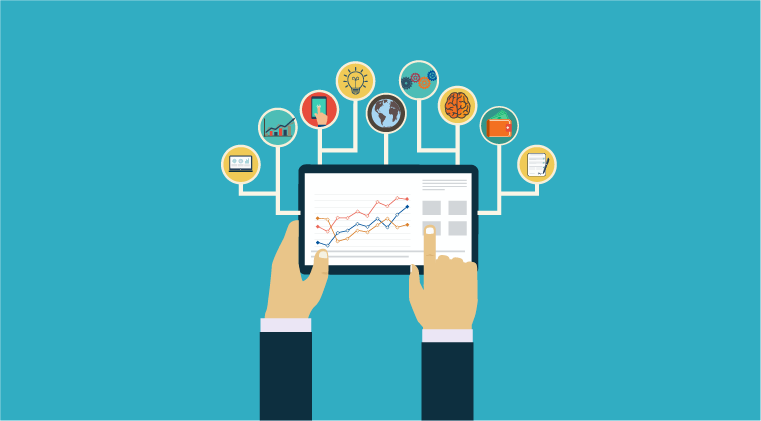 Are you leveraging client data effectively? Data abounds in the digital age and most financial services businesses are barely scratching the surface of incorporating that data into their sales and service efforts. Tracking basic financial data, such as what you would collect for a typical financial plan, can reveal gaps and opportunities to serve clients better. Advisory practices that have digital systems in place to collect, track and analyze client data can easily identify many opportunities within existing books of business to serve clients better while growing their businesses. Do you have a mechanism for cross selling? Most financial advisory businesses today are based on managing one aspect of a client’s financial needs – for example, investments or insurance. However, your clients have other needs for financial products and services, such as travel insurance, property and casualty coverage, and banking services, just to mention a few. A cross-selling platform would enable you to partner with other vendors and service providers and leverage your relationships to offer your clients additional services. Are you protecting your client’s security? The majority of advisory businesses are communicating with their clients using mobile devices to send and receive emails and text messages. With growing risks of hackers gaining access to online communications, it is critically important to take every precaution to prevent personal and private client data from being exposed. This is a serious business risk that many advisory businesses are not well equipped to manage. 2. 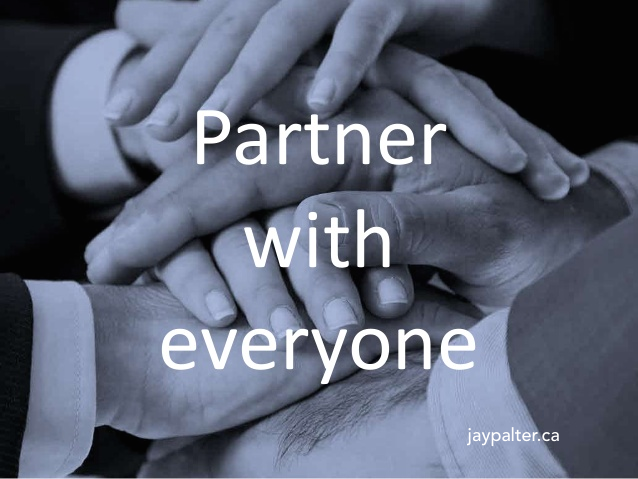 PARTNER with everyone – Add value by broadening your offering, building partnerships and engaging your clients. The first partnership in your advisory business should be between you and your client. Stop thinking about transactions and seek to build a partnership with your clients. If you are attuned to your clients’ situations, it will be clear that they have needs that are outside your area of expertise. Are you training your clients to use you as a concierge? Clients that have dealt with you only as an investment or insurance advisor for many years may not be used to thinking of you in a broader, more holistic, service context. You should be training your clients to come to you to help them find the products, services and/or expertise they need for a wide variety of needs. This is not only about messaging, but also about developing the tools to broker these types of referrals relationships. Are you complementing your core services and partnering with other subject matter experts? If you take seriously the notion of providing lifetime value to your clients, then you should be striving to help them find the best people to complement your services. Building a dream team of advisors for your clients both helps you serve them better and build a more viable long-term value package for retaining your clients. Your clients are people, like you. They live in communities. They have families and are often parents. They are interested not only in their own lives and financial affairs, but in making life better for others in their community. You should be aligning your business with causes that improve the community and address the communal aspirations of your clients. This is also an effective way to build engagement and support among your staff. 3. 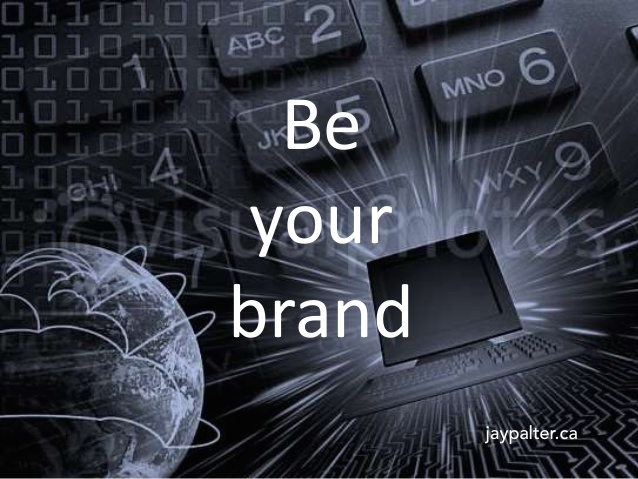 BE your brand – Make digital communications a core competency of your business. Are you helping clients and prospects find helpful information online? More than half of the buyer’s journey is happening online before that person shows up in your office or at an event or in your sales funnel. Prospects are doing their own online research and you need to provide helpful resources to guide them in their journey. Are you savvy in how to conduct relationships online? Social networks are often called the social telephone because the conversations that are happening online are often replacing other types of communication. You and your business need to be present and helpful where your clients and prospects are having conversations about their lives and their needs. Savvy social businesses realize there is much to learn from just listening and engaging. c. Are you being a social seller? Social networks are not all about (or even mostly about) marketing. They are ALL about relationships. Social sellers learn how to use online social networking to share helpful information, engage in relationship-building conversations and hone their professional reputations. Social businesses train their people in the art of social selling and support them with information and resources to share. While these suggestions are by no means exhaustive, but they point in the right direction. The need to embrace digital technology and innovation in financial services, to listen to markets and build partnerships that serve them, and to master the art of human communication in the age of social business – these imperatives will only increase with the passage of time. To view this article as a Slideshare presentation, see Surviving and Thriving in the Digital Age of Financial Services. Amazingly comprehensive article. We have taken full advantage of mobile app technology to grow the number 1 mortgage app in the country and also offering anyone their own custom mobile app solution. This article is the proof that we are on the right track enabling professionals to connect and engage with their clients via mobile. Thanks Jay. Thanks for the feedback, Ben. And yes, you are on the right track offering advisors the ability to leverage a rapidly growing mobile technology platform for engaging prospects and clients. Keep up the great work!